It's an unfortunate thing in life that one of the first things on our skin to show aging is the neck and décolleté. This is due to sun damage (photo damage), smoking and a little bit of genetics. It's mostly sun damage and smoking. What is usually seen is a slackening of the skin, extreme hyperpigmentation and many wrinkles. SiO Beauty Décolleté Wrinkle Smoother System hopes to address this by smoothing out the neck and chest area, lifting the skin, reducing age spots and hyperpigmentation and getting rid of wrinkles. It is a three step system that should be used in conjunction with each of the other products to see best results. The system includes SiO Cleansing Discs, SiO Skinpad and SiO Serum. These Décolleté Cleansing Discs maximize the wrinkle smoothing effect of the three step SiO regimen, and are highly effective for use prior to the application of the SiO SkinPad. The discs light exfoliate and clear pores to prepare the décolleté for the SiO SkinPad to achieve the best possible reparative effects. By cleansing and drying the skin correctly, putting the SkinPad itself on the body will be easier and more comfortable. The discs contain a dual glycolic and lactic acid blend encouraging exfoliation to reveal healthy, glowing skin. The zero alcohol-based formula also reduces the appearance of fine lines, wrinkles and sun-damaged skin. Use in the evening prior to the SiO SkinPad application to gently remove dull skin cells and allow for maximum adhesion for the SkinPad. These discs are specially formulated for the décolleté. Wipe the décolleté and cleavage area in a circular motion with a disc. Ensure you clean the entire area the pad will cover. Allow skin to air dry or pat dry with a lint free towel before SkinPad use. Use ideally 30 minutes prior to SkinPad application. The décolleté must be completely dry before applying the SkinPad. If you get the Décolleté Cleansing Discs delivered every 30 days there is a savings, and you only pay $39.00 for the 30 pack of discs. The SiO SkinPad is a patent-pending "secret" to anti-wrinkle success. The secret is that they use the same science that was previously recommended by doctors and surgeons for the purpose of healing scars and burns. The SkinPad is cutsom designed to be worn on the chest décolletage and fitomen of all ages and body types, It is worn overnight, during which time it restores the natural, youthful beauty of the décolleté, while also acting to prevent future wrinkles from forming. Each SkinPad lasts for 15 uses, and can be rinsed under water or washed with a mild soap to revitalize the adhesive anytime. All SiO products are clinically tested, allergy tested and manufactured using the highest quality and safety standards. The SkinPad is made of pure medical-grade silicone and features an ultra-thin coating of adhesive, which allows the SiO SkinPad stay on the body. The adhesive is cleared by the FDA for usage in medical devices and has been rigorously tested to deliver the highest level of safety, performance and comfort. It is Dermatologist approved, allergy tested, non irritating, safe, comfortable and reusable. The benefits of the SiO SkinPad are varied and excellent. You get overnight results in just 8 hours. It significantly reduces the appearance of wrinkles. It intensifies skin hydration of dry, fatigued skin. The pad restores and normalizes collagen. It softens the look and feel of crepey skin. The SiO SkinPad has a tapered fit, it is worn comfortable while you sleep or for as little as 3 to 4 hours. The pad is reusable and washable. Each SkinPad lasts 15 days (30 day supply per pack) and can be rinsed under water and washed with a mild oil-free soap anytime to revitalize the adhesive. It creates a breathable 'micro-climate' underneath the pad, that draws moisture to the skin's surface. The SiO SkinPad is made from silicon (Si) and oxygen (O). Silicone in its most basic form is composed one one atom of oxygen and two atoms of silicon. These form polymers, which are then linked together to maximize the permeability of the material. By creating the ideal material oxygen is allowed to pass through, while moisture is locked in creating the ultimate wrinkle-smoothing climate. To use: thoroughly cleanse and dry skin before using. 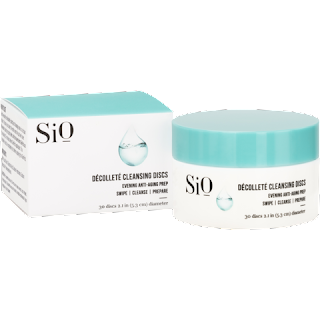 Made sure to use the SiO Décolleté Cleansing Discs.Gently remove the clear film from the SkinPad. Place the self-adhering pad on chest. Ideally wear while sleeping and gently remove in the morning. Wear for a quick boost any time for an hour or more. The rosy glow upon removing the pad will dissipate in a few minutes. You may rinse the pad with water and all it to air dry anytime to revitalize adhesion. Place your SkinPad, adhesive side down, on enclosed storage shield. Each pad is reusable up to 15 times. The SiO Décolleté Serum is an innovative Morning Wrinkle Smoothing Concentrate designed to rejuvenate and protect the décolleté. It is recommended for use after wearing the SiO SkinPad overnight but works effectively on its own as well. This serum was designed to be used in the morning after removing the SiO SkinPad. If you skip a night wearing the SkinPad, it is recommend that you continue to use the Serum consistently as the wrinkle smoothing, hydrating and brightening effects are cumulative and maximized over time. It works intelligently alongside the SiO SkinPad to extend and maximize the wrinkle-smoothing and skin softening effects. Designed to provide deep, skin-plumping hydration, brighten skin tone, and protect against new environmental damage. Last but definitely not least, helps stop new wrinkle creation from starting. The ingredient highlights of this serum are astounding. SiO's unique Vitamin C Matrix is clinically proven to significantly reduce hyperpigmentation, spotting, blemishes and uneven skin tone in 86% of study participants within 45 days. Because this next generation Vitamin C Matrix is suspended in oil and water, it maximizes hydration absorption. The Vitamin also brightens skin by reducing UVB free radical damage. Shea butter , Licorice Root and Aloe come together to attack one of the primary causes of aging. Inflammation. Shea butter is a primary source of anti-oxidants with anti-inflammatory properties. Licorice root is a natural ingredient that reduces inflammation and brightens skin. Also is the anti-inflammatory natural, trusted for millennia. A proprietary black, white and green tea blend is nutrient dense in anti-oxidant, anti-aging activities. A Sunflower Seed Oil naturally repairs and feeds the skin's own barrier. Coconut Oil smooths skin and infuses youth enhancing vitamins and minerals. Finally, Vitamin E reduces free radicals caused by daily UV exposure. Stevioside is a breakthrough extracted from the Stevia plant. It proactively minimizes new wrinkle creation by preventing the involuntary muscle contraction that causes skin to wrinkle. A powerful complement to the SkinPad, which also prevents wrinkle creation through its physical compressive quality. A power trio of hydrators work together to provide both surface and deep skin hydration. Skin is 64% water and reinvents itself every 27 days approximately. This means maximal hydration is critical. Used post SkinPad, this trio works to acheive a younger texture and more youthful vibrancy. You can see a huge difference in the amount of hyperpigmentation, uneven skin tone, slight wrinkling and overall general apperance of the neck. It really did help with the photodamage. I was very happy with the results. After 45 days using the SiO SkinPad and Décolleté Serum 86% percent of participants saw a significant decrease in photodamage. Significant improvement in all symptoms of photo damage including hyperpigmentation, spotting, blemishes and uneven skin tone were seen. By using the Décolleté Serum with the SkinPad participants saw DOUBLE the increase in firmness vs. the SkinPad alone. There was a 66% increase in wrinkle reduction when using the SkinPad and Décolleté Serum together vs. the SkinPad alone. The SiO Décolleté System is not inexpensive. If you are going to purchase the products and find that you like them, I advise going the subscription route. It will definitely save you money. The products do work. Luckily at this point my chest is in pretty good shape but I could use a little bit of lift and I have some pigementation issues. How did these fare with this system? Very well. I noticed that my skin felt lifted and my pigmentation issues decreased. My freckling got better. I was very satisfied with the results I achieved from this system and would love to continue to use it. The system can either be purchased as a one time shot or by subscription. You save money when purchasing by subscription. The Décolleté Cleansing Discs are $29.95 for a one time purchase but are $24.95 when purchased through the subscription program. 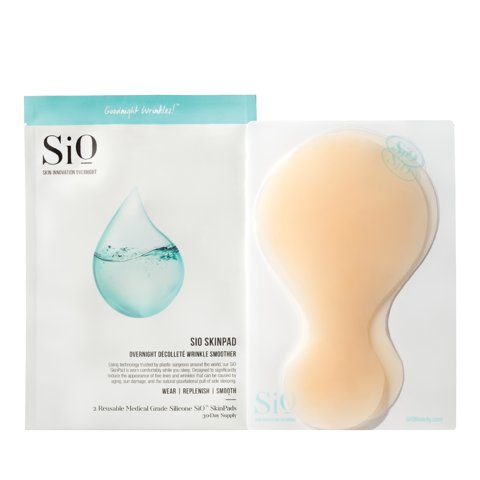 The SiO SkinPad is $49.95 when purchased for a one time fee but is $39.95 when purchased through the subscription program. Finally the Décolleté Serum is $59.95 when purchased alone and is $49.95 through the subscription program. The subscription program can be done every month, every two months or every three months. A one time purchase of the complete SiO Décolleté System is $139.85 or $114.85 through the subscription program. 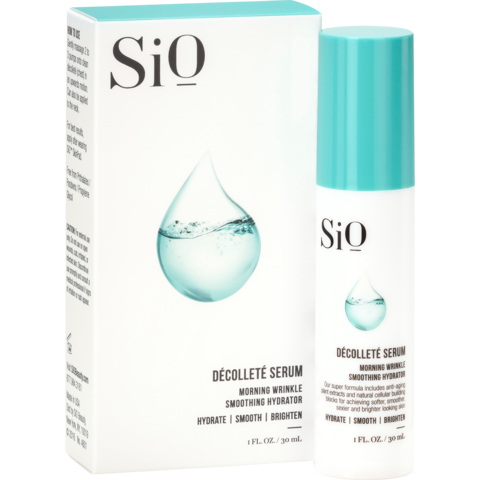 SiO Décolleté Wrinkle Smoother System is available from www.siobeauty.com. Like SiO Beauty on Facebook:https://www.facebook.com/SiOBeauty/; Follow SiO Beauty on Twitter:@SiObeauty; Follow SiO Beauty on Pinterest: https://www.pinterest.com/siobeauty/ and Follow SiO beauty on Instagram:https://www.instagram.com/SioBeauty_/.